Add a lovely touch of holiday spirit with our elegant Red Plush Embroidered Christmas Stocking. 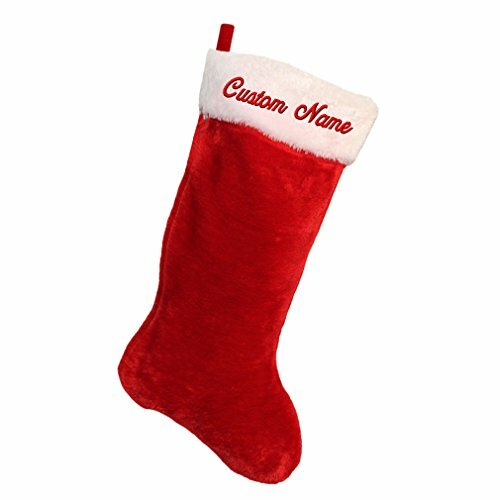 Perfect for every member of the family to enjoy for years to come.Your Embroidered Plush Christmas Stockings measure approximately 17.5" long in a soft, plush material. Total length with folded cuff may vary slightly. Christmas Stockings include FREE Embroidery. PROFESSIONAL EMBROIDERY: Beautiful and high quality professional machine embroidery with great detail. With decades of experience in producing the highest quality embroidered products we stand by our promise and bring you highest quality machine embroidery. CLASSIC LOOK: Our red plush stocking with a white cuff is the quintessential Christmas stocking design. It's a timeless design that would compliment any décor and bring warmth and Christmas cheer to your house. GREAT FOR ANY FAMILY MEMBER: Create great memories this Christmas Season! This traditional design will please any member of a family and will bring a smile to their faces when they see their custom names embroidered on a cuff.